Joint Dysplasia – This condition is a development issue that occurs when a hip or elbow joint is malformed before birth. This causes the joint to slide around in the socket, sometimes popping out of place completely. Sound painful? It is, very much. If left untreated at the first sign of a limp or awkward gait, this condition could deteriorate bone and cartilage, resulting in pinched nerves and severe arthritis. Surgery is the only way to fix joint dysplasia. Von Willebrand’s Disease – In dogs, VWD is caused when the blood-clotting protein is missing from blood platelets. This results in excessive bleeding during everyday activities, like urination or rough playtime with other dogs. Skin bruises easily and anemia can set in if blood loss is too great. Typically, this condition cannot be cured, but it can be managed with lifelong regular transfusions and platelet-building medications. Despite a genetic predisposition for a variety of health problems, the Golden Pei is a relatively healthy dog. Particularly in the first two halves of its life. Most health issues don’t set in until the Golden Pei is well into middle age, around 7-8 years old. The average lifespan for a Golden Pei is 12-15 years. Calm, affectionate, and gentle, the Golden Pei is a large crossbreed with a heart of gold. He is protective in times of distress to his family, and is attentive, alert, and intelligent. All traits that make him an excellent watchdog and night-time guard dog. These dogs are wary around strangers, but never outright aggressive unless threatened directly. If new people hang around often enough, they will be accepted into the overall pack. 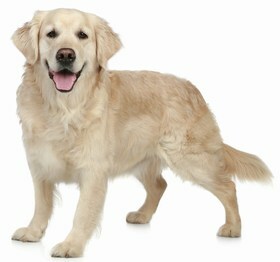 This means that they will become friends to the Golden Pei and he will seek affection from them. Good news for relatives and frequent visitors! Generally good-natured and kind, the Golden Pei has a strong-willed stubbornness which will show during training or in bouts of dominance against other dogs. If he is challenged by another dog, this crossbreed pup will rarely back down. To train him, you have to establish yourself as the alpha of the pack. Use clear, repetitive commands in a concise, firm tone to let him know that you’re the leader. When he views you as his alpha, he’ll sync up with your requirements, making it easier for you to issue new commands and instructions. The Golden Pei is a trustworthy dog, commonly used to protect young children when they’re playing alone in the yard or left home by themselves. He is highly intelligent and will go to great lengths to protect his loved ones, if necessary. These dogs do not respond well to harshness or negative attention, so teach children that will be around the dog how to properly show affection without pulling or overwhelming the Golden Pei. Exercise-wise, the Golden Pei needs regular, lengthy walks, at least twice per day. Keep toys around the house to occupy his mind when you’re away. 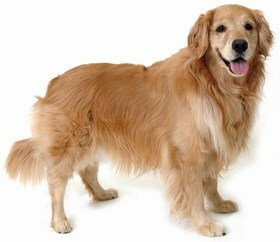 He is a great jogging companion, loves playing frisbee or fetch, and would do well playing in a fenced-in backyard. He could adapt to apartment living if you offer him other daily outlets for his energy. Where the Golden Retriever’s fur is double-coated and water repellent, the Chinese Shar Pei is known for wrinkles upon wrinkles of short, fine hair. Your Golden Pei could have either of these coats, or a combination of both. Brush his hair once a day to maintain a smooth, soft, shiny coat. Use a solid-bristled brush to eliminate excess hair and pet dander. Keep your Golden Pei’s ears clean and healthy with weekly cleanings with vet-recommended solution and a cotton swab. Never poke a swab into the ear canal because that could lead to infection, or worse, rupture the ear drum. Instead, clean around the ear rim to clear away waxy build-up and debris. Divide the Golden Pei’s meals into two per day, with 1 ½ cups of dry, high-quality dog food per meal. With big appetites, these pups are prone to overeating, which can lead to health issues, like obesity. His kibble should be a reputable, nutritious brand that lists lean meats and whole grains among the list of wholesome ingredients. Use your judgement to seek out a nutritious, reliable dog food brand, one that saves you money but keeps your Golden Pei in good health. Looking for a Golden Pei? Check the local shelters for a Golden Pei before looking for a breeder. You could give one of these crossbreed canines a chance at a fresh start in a new, loving home. Adoption fees run between $250 to $300. These fees usually include a health check-up and initial vaccinations. You should also consider the costs of toys, food, regular vet visits, heartworm prevention, and flea protection. If you opt for a breeder, expect to pay $400 to $800 for a Golden Pei puppy. You may be required to sign a contract that states your intention of getting your new pup spayed or neutered, so keep that expense in mind too. Ranking takes into account a few basic factors including cost, skill level needed, high vs low maintenance and how critical regular training is to success. The Golden Pei is a solid 2.5 on the integration scale. He is sweet and loving when well-trained, but his stubbornness takes determination and patience to overcome. His dog food and future medical bills could also be a drain on your wallet. In other words, he is a big responsibility. 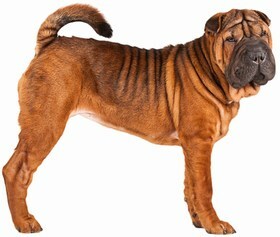 Otherwise, the Golden Pei is a great dog that would be a caring, cuddly addition to your family.